I am so excited to have the creator of Salty Little Bums, Kendall Hicks, on the blog today! 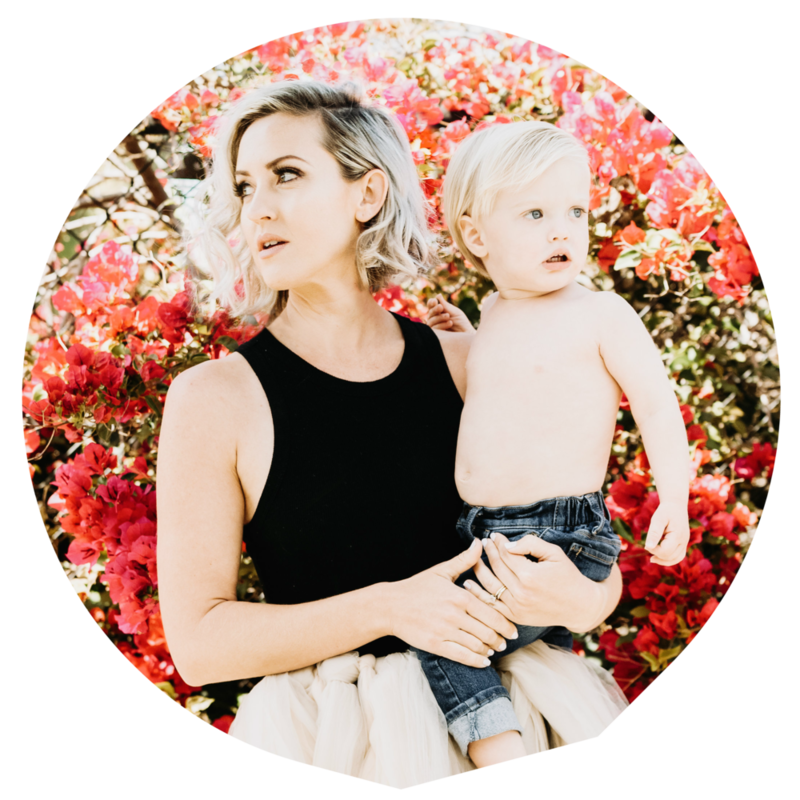 This modern mama does it all and I LOVE her style! She's super funny and totally down to earth. I love her take on motherhood and balancing her business. Oh and did I mention she like just had a baby a few moths ago?? She's a total babe and I can't wait for you to get to know her so let's jump right in! Kendall: Hi! My name is Kendall and I own Salty Little Bums, a modern baby and kids online clothing shop. I have two kids Hudson James (2) and Hensley Rowen (2 months) we currently live in Pasadena CA. TMM: What made you decide to start your own business? Kendall: I have always been creative. Before I started Salty I use to make my own greeting cards and invitations. I’ve always been drawn to that sort of kid like design so when I was on maternity leave with my first born, I had the urgency to do something with myself. TMM: Where did you come up for the name for your brand/ business? Kendall: My husband and I both grew up near the water. I grew in Florida and he grew up in the south bay. When I knew this little idea I had was going to grow into something more I sat and sat trying to figure out a name. I knew I wanted something that had a beach vibe but I also wanted something a little modern. Salty was a word that kept sticking out to me and I also called Hudson little bums when he was born. One day I just said out loud “what about Salty Little Bums” and it just stuck. TMM: How do you keep your sanity and run a business and be a mom and be a wife? Kendall: Honestly I don’t even know. Ha! I think what pushes and motivates me the most are my kids. I want to look back on my life in 30 years and say that I did everything I could to give them a wonderful life. Plus I’m sleep deprived, so I’m sleep walking, talking and functioning 99% of the time. TMM: What do you love most about being an entrepreneur and what has been the hardest to learn? Kendall: I love that I have full control over my vision. My husband also helps me design but he knows that I have a certain look and style I try to achieve so he has to run any ideas by me. :) I’ve learned that it takes time, you can’t rush designs or ideas. Sometimes there are times when I know something will be a big hit and I’m totally wrong. You just have to learn and grow from everything. Kendall: There is nothing that compares to that moment you become a mom. I’ve changed in so many ways and in one way it has caused me to learn how to be selfless. I love being a mom, especially to my little ones. No doubt we have our struggles but it’s made me realize that no matter what life throws you, at the end of the day my kids are so loved and that is all that matters to me. Kendall: This really isn’t a tip or trick but it’s something that has always stuck with me. Someone once told me that having a second child is the greatest gift you could give your first born. It's not for you, it’s a selfless sacrifice you do for your children and it betters them as humans. I agree. Kendall: My first I had contractions for a week before I actually had him, now talk about miserable. I was “in labor” about 12-14 hours and had him naturally. With my second I had started dilating around 38 weeks so my Dr said I could be induced at 39 weeks if I wanted to. We went in at 8am on a Sunday got the epidural and they broke my water. I was never actually induced bc my contractions started and she came 6 hours later. Not to mention only two pushes and she was out. It was amazing! Kendall: Just finding the balance. I don’t work out much these days and I don’t always eat the best so I try and watch what I eat. Kendall: SKIP SCHOOL hahaha in high school I felt like I had better things to do and looking back they weren’t better. I will tell them of my struggles and hope they see the importance of not skipping. Kendall: I try and take some time out of my day to do something I want to do. I struggle with this though because I find myself feeling guilty, but I feel it’s important to do things for yourself. You cant forget who you were before you had kids. Kendall: My purse right now is my Fawn Design diaper bag so I have a lot but here I go! Claire Vivier Wallet, Gum, Raen Sunglasses ,Honest Beauty Balm, Pixi Shea Butter Lip Balm, Gathre Changing Pad, Diapers, Wipes, Nursing Cover, Flamingo Baby Swaddle, and a change of clothes. Kendall: I don't have any beauty tips because I don't usually wear a lot of makeup but my go to would be brows, mascara and good lip balm.